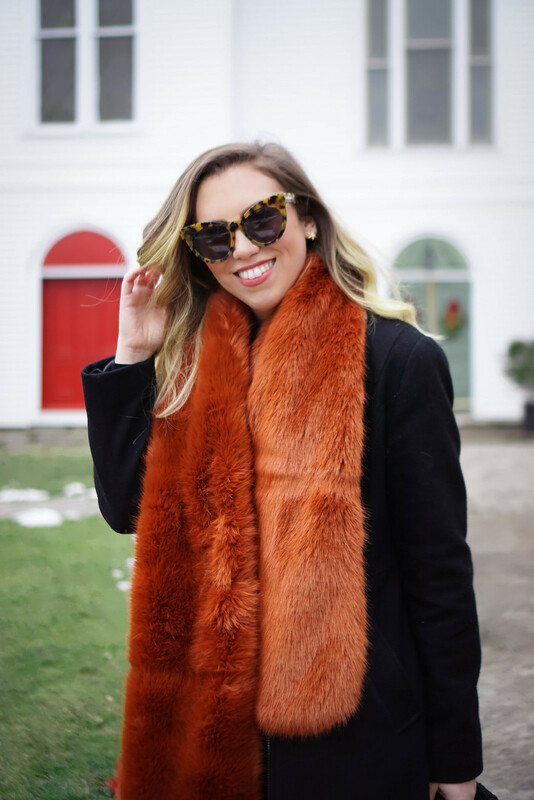 Move over blanket scarves because I’m currently obsessed with faux fur scarves and you should be too! They’re infinitely cozier than your typical wool scarf and way more chic! I’ve been wearing faux fur collars on my coats for years, but this Winter I’m upgrading my look with a scarf. Even a beyond basic outfit like this one looks SO much better with the addition of this burnt orange fur. Faux fur scarves can make your casual outfits a little more special and your dressed up looks totally glam! And I don’t know about you, but that sounds pretty good to me! I had about 10 different colors on my wishlist, but decided on this burnt orange colored one that of course is now sold out, so I rounded up a bunch of my favorites all under $100 for you to shop!